A number of Huntley High School student-athletes were recognized at the Northwest Herald’s Most Valuable Athletes Awards Show on June 7 at the Woodstock Opera House. 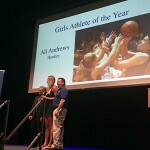 Girls basketball standout and University of Illinois commit Ali Andrews took top honors as Female Athlete of the Year. Over her four year high school career, Andrews shattered numerous school and county records and led the Red Raiders to three sectional championships. A prolific scorer, she finished with 2,548 career points. Huntley High also received the All-Sports Award, given to the Fox Valley Conference school each year with the best combined boys and girls sports. Huntley finished with 120 points, Prairie Ridge was second with 117. The school received a traveling trophy it will keep for the next year, as well as a $2,500 donation to the athletic department courtesy of Dr. Steven Rochell, an orthopedic surgeon from OrthoIllinois in Crystal Lake. 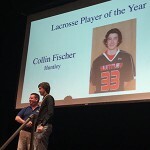 Collin Fischer – Boys Lacrosse Player of the Year. Congratulations to these outstanding student-athletes!